There have been countless theories of interpretation, and no shortage of learned literature, about “Happy Days.” The entrancing, harrowing two-act play is widely considered one of Beckett’s best. The latest incarnation, a Yale Repertory Theatre production, opened last night at Theatre for a New Audience in Brooklyn. It features Winnie (Dianne Weist) and Willie (Jarlath Conroy), who are presumably married and share the predictable attributes of so many other married couples: she can’t stop talking, while he seldom speaks up, a state of affairs that makes “Happy Days” all but a woman’s monologue, one that some female actors dread and long to play, and which some others yet consider the female equivalent of playing “Hamlet”. The action begins with the deafeningly loud clang of a bell, which startles Winnie up from her slumber and brings her back to a consciousness she is most likely seeking to avoid. 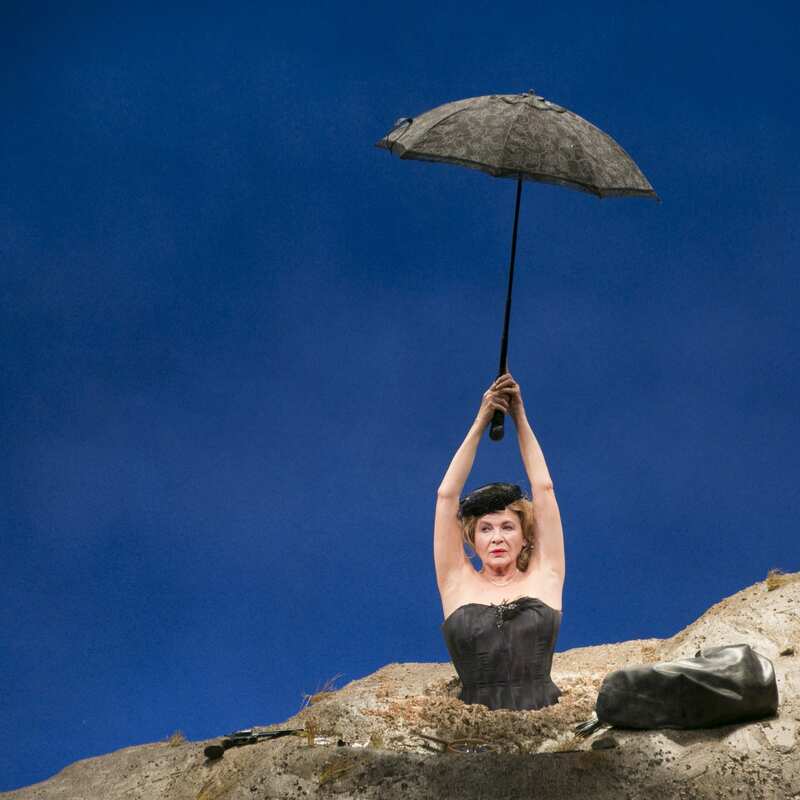 For, you see, she is trapped up to her waist in a mound of earth, scorched by the sun, the few crippled plants sprouting about nothing but gnarled, piteous specimens of vegetation (the hauntingly beautiful scenic design is by Izmir Ickbal). “Another heavenly day. Begin Winnie. Begin your day” she prompts while stretching her arms upwards toward the blazing sun. Willie, who lives a few feet away, behind the dunes, begins instead to silently read the newspaper. Unlike Winnie he has freedom to use his legs and crawl about (as he will, unforgettably, by the end of the second act). The role had always seemed utterly daunting to Weist. 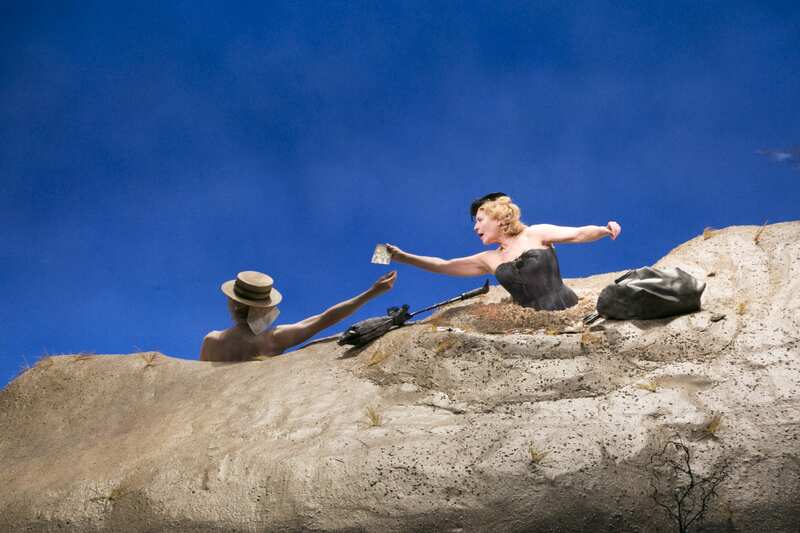 Aside from requiring a nuanced mixture of humor and pathos, Winnie entails performing what amounts to a monologue for nearly two hours, while halfway, and then almost entirely, submerged in sand. Her counterpart, her husband Willie, utters just one word in the entire second act. Over ten years ago, director James Bundy asked Wiest if there was a role she’d like to play, if she could choose, and she told him Winnie. But it wasn’t until 2014 that she decided to take it on. Some have perceived misogyny in Winnie’s predicament, pointing to her endlessly chattering nature as a trite female stereotype. As Catherine Sheehy, the dramaturg for this production, remarks in the show’s program : “Considering Samuel Beckett’s work in full, however, you could be forgiven for concluding that for Beckett a woman’s place was most often in the scenography.” She proceeds to point out that Nell in Endgame lives in a dustbin, while W1 and W2 are encased in urns on either side of the adulterous M in Play. An additional interpretation might consider it was the author’s aim to portray women as trapped by the unfair societal conventions of their gender. It s perhaps part of the genius of Beckett’s art to provide fodder for a seemingly inexhaustible array of arguments, propelling the thinker to dive ever more deeply into her thoughts. Winnie is optimistic but vanquished, charming but irritating, funny but dejected. Her endless banter is but a mirror of our restless minds, condemned to seek order amidst unending chaos, and crave respite from the unceasing ebb and flow of our delights and sorrows. And so it goes for many of us. We huddle at the local, crowded Starbucks for hours, never to make conversation with anyone. Isn’t it better than sitting home alone? We spend our lives in apartment buildings populated by dozens, sometimes hundreds of souls whose names we’ll never know. Like poor Winnie, the best we can do upon waking is to hope, against all hope, for yet another happy day. Happy Days, by Samuel Beckett. Directed by James Bundy. Starring Dianne Weist and Jarlath Conroy.